I was playing around with the Gina K Designs 3.75 inch wreath template again. I stamped the Hero Arts holly leaves in 3 different colors of distress ink to create the wreath, then colored the berries with a distress marker. The finished card is 4.25 inches square. Supplies: Stamps – Hero Arts, paper – Neenah Classic Crest Solar White, Stampin’ Up! Real Red, inks – Tim Holtz/Ranger Distress Inks Crushed Olive, Festive Berries, Mowed Lawn, Shabby Shutters, VersaMark, die – My Favorite Things, corner punch – Stampin’ Up!, embossing powder – Stampendous Detail gold, gold cord – Paper Mart. 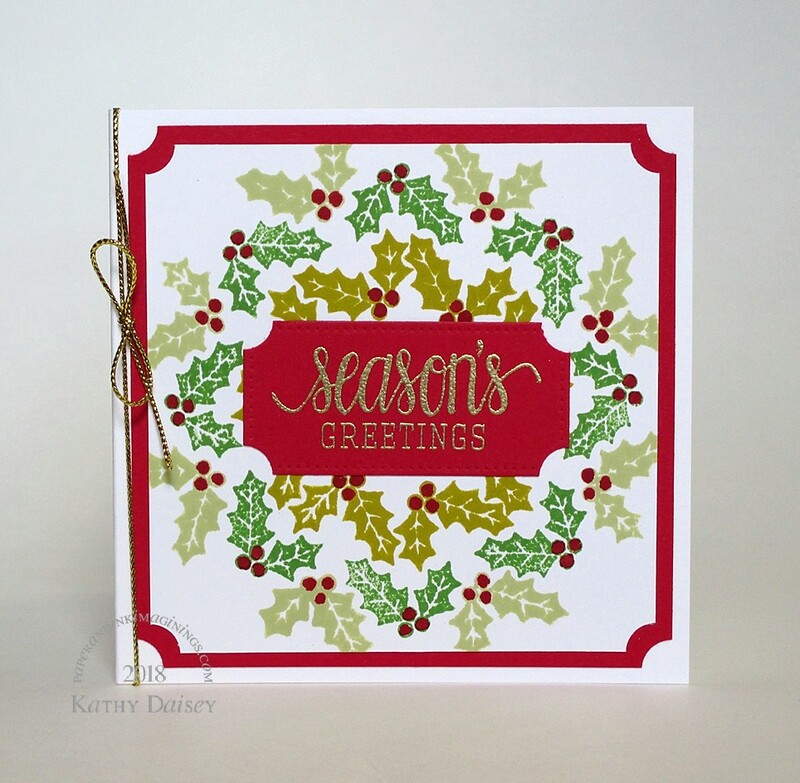 Categories: card, holiday | Tags: card, Hero Arts, My Favorite Things, Neenah, Ranger, Stampendous, Stampin' Up!, Tim Holtz, Tsukineko, VersaMark | Permalink. Thank you, Miss Hammie!! Hope things are well with you! Things are going well for the most part. I hope all is going well for you and yours. This are mostly good here. Trying to wrap my head around all I have to do for December! Beautiful card . I love holly!